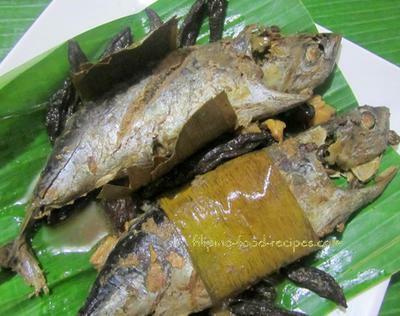 One of the Batangueños' pride when it comes to food is the “Sinaing na Tulingan”. 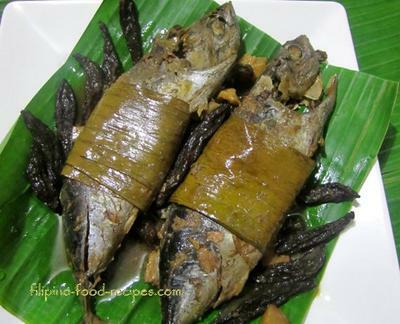 A dish that is normally cooked in slow fire for 6 - 8 hours using wood chunks or charcoal until everything including the fish bones are soft to the bite just like sardines. The sauce or the liquid that comes out of it which they call “patis” (fish sauce) is so tasty that even a teaspoonful is enough for a 2 cups of rice measure. Also, the addition of the dried Kamias in the sauce, plus the manner in which it is cooked contribute to its distinct taste and aroma not common with any other fish dishes anywhere else. We learned about the Sinaing na Tulingan from our father, Leon Banta Jasa, who was a true Batangueño. He would buy them every time he sets foot in Batangas and we would not get tired of having them each meal for 2 days. They would usually last for days without refrigeration because of the way they were cooked. As for my version of the recipe, I added one pack of magic sarap which I think took it to the next level. 1. Wash and clean the fish thoroughly and make a slit in the middle. 2. Rub rock salt into the fish (make sure to use all the salt). 3. Press to flatten the fish and cover the middle of the fish with banana leaves. 4. Arrange the fish onto a shallow pot or a pan by putting the pork fat first and the half of dried Kamias. 5. Arrange the fish and add the remaining kamias. 7. Cook slowly in medium-low heat for 5-6 hours. Make sure to add enough water when the juice evaporates (keep on doing this until the fish becomes tender). 8. Add the magic sarap. 9. Cook until the sauce is reduced and the fish meat is tender.